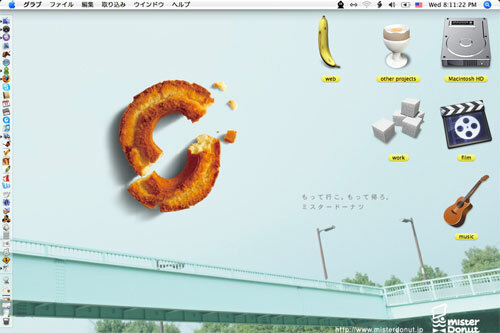 The new ad campaign for Mr. Donut’s Honey Dipped donuts hit the walls of the Ginza Subway line this week. I am always in awe of their design team. For this campaign, they use the acronym UFO, in this case, for Usomitai ni Fuwafuwa no Oishisa (unbelievably delicious pillowy softness). I can’t seem to find a photo of the posters I pass every morning, but upon my search – I stumbled upon another example of their impressive design sense… a desktop image (shown here in practice on my screen). This entry was posted on March 7, 2007 at 11:14 am and is filed under *Yoko, design, tech. You can follow any responses to this entry through the RSS 2.0 feed. You can leave a response, or trackback from your own site.